Upon moving back to San Diego and our search to find the best brunches this amazing city has to offer, we heard there was a PAJAMA brunch hosted in La Mesa on Saturdays and Sundays. We, of course, couldn't pass up the opportunity to be able to roll out of bed, stroll out of the house and visit an establishment where it would be socially acceptable to chill in our pj's! It may not have been breakfast in bed, however, when it’s with your friends and new friends, it’s a whole new level of the brunch life - it’s a big ol' slumber party! When I realized it was The Hills, I was so disappointed in myself that I missed out on the pleasant experience they had to offer to patrons over the previous years. It's Sunday at about 10am and The Hills was packed as we waded through the PJ adorned crowd! Most were decorated in their Chargers gear (Go Chargers) and ready to watch Sunday football. As we walked through the smaller dining room and bar we passed families, different generations, fun wood work, and cool touches like the garage door windows. We walked by the waffle bar corner and it automatically peaked curiosities and attracted eyes as some of the gals excitedly exclaimed, "this place looks like it’s going to be great!" Per the usual GTB melting pot, we had our familiar faces and chances to make new friends around the table, which is always a beautiful sight to take in. We were able to sit on the covered patio in the back which provided all the ambiance, pretty natural lighting and space for heartfelt conversations, networking and yummy food. 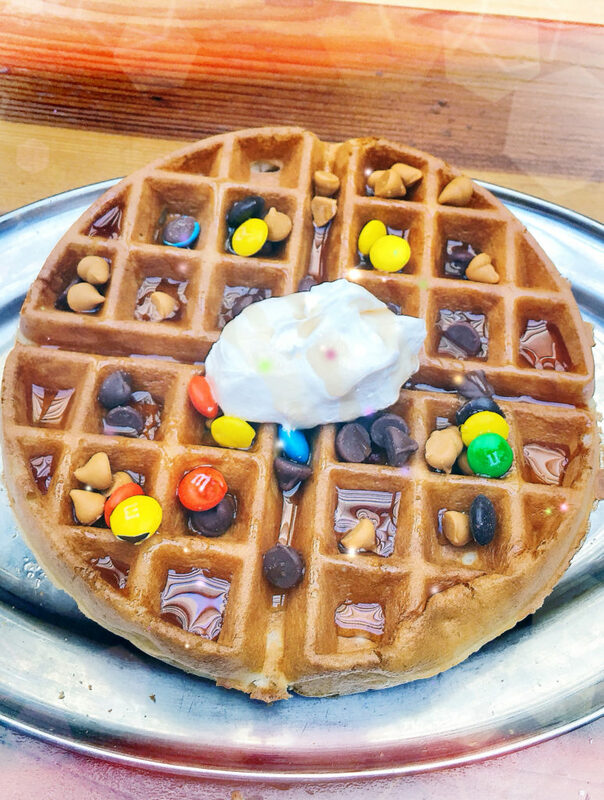 The claim to fame on this brunch destination was the “if you wear your pajamas” you get access to the $5 all you can eat waffles and topping bar, along with the $3 dollar mimosas with FRESH fruit purees that took them to the next level. While we waited and gabbed, we couldn’t pass up the brunch appetizers, and as you can see from the pictures below, they were GLORIOUS! We were divinely swept away in the thrill of sweet and warm honey comb biscuits with California wild flower honey, fresh whipped cream & fruit. With that buttery crumble to touch, there were knives diving in left and right forking the luxurious bites away…they were diminished in seconds. And then…and THEN, the chicken and biscuit sliders hit the table. You just had to stare for a moment as your eyes feasted on the golden brown crispy chicken that laid in front of you on another “Julia Child would be so proud” buttery biscuit with a sweep of Ancho Maple Glaze that you couldn’t help but keep saying yes, whatever it is: YES, YES, YES! We told Pete, the manager, that we just possibly couldn’t do more…okay, twist our arm, we are in for it. The next bomb dropped to the table (mind you, we hadn’t gotten our entrees YET) and swept us away again to yet another dreamful state as we indulged in the breakfast boar sliders: sweet rolls with wild boar sausage, mozzarella, scrambled eggs, AND my personal highnote was the ever so favorite GARLIC POBLANO CREAM CHEESE. My taste buds soared. For the savory brunch connoisseur, you will not want to miss these! For our sweeter side gals, they fought for every last crumb of the honey comb biscuits, which we will go back for over and over. I must note that having just returned from living in “the south” for the past 18 months, those biscuits could absolutely make a name for themselves and, dare I say, the best in the land known as San Diego. Just at the moment, we thought we could call it quits, the dawn of a whole new level of foodie bliss was about to begin. Waffles started to pop out of the kitchen, glorious light golden brown Belgian waffles that took over an entire plate, and just when you thought your stomach couldn’t handle anymore, your eyes said otherwise. As some of the gals started to come back from the waffle bar, we saw waffles dazzled with M&M's, chocolate drizzle, fruit and whipped cream. We gals were so giddy that we could let our inner 10 year old out loud and proud and have no shame. As I was about to regret not ordering the waffle bar, my eyes had drifted to one of the most uniquely named entrees, the “Dragon Tiger Phoenix”. I honestly don’t think I even read the description and just said, "Whatever it is, that’s what I want". To my surprise, my sweet and savory taste buds were appeased with a decadent rich dish of fresh fried French (say that three times fast) toast sticks, hand breaded chicken, cream cheese hollandaise, siracha drizzle and two eggs. Yep! You read that correctly, AND the French toast had a sweet bread pudding with a nutty and dried cranberry mix. I didn’t know such a combination of flavors could make such a statement. Other high notes on the menu were the apricot ham Sammy: Bavarian ham, fried egg, melted Swiss, and an apricot honey glaze. The “GAME” changer was a hit: house-made wild boar sausage, scrambled eggs, more buttery biscuits, crispy potatoes and house-made sausage gravy. We took our best stab, but it’s a ton of food. We finished a quarter of it and then boxed it to go. One of the gals came to us from our Instagram community, a first timer, and it was so neat to hear her story, her heart and how funny life works. At one point, both of us got teary-eyed as it became clearer of just how big this is. We all exchanged phone numbers, Instagram handles, Facebook profiles, future brunch deets and hugs. It was a brunch well done. Later that day, I teared up again as one of the gals wrote the following, “When you go to brunch dressed in your PJs and after a few moments you realize something special is happening. 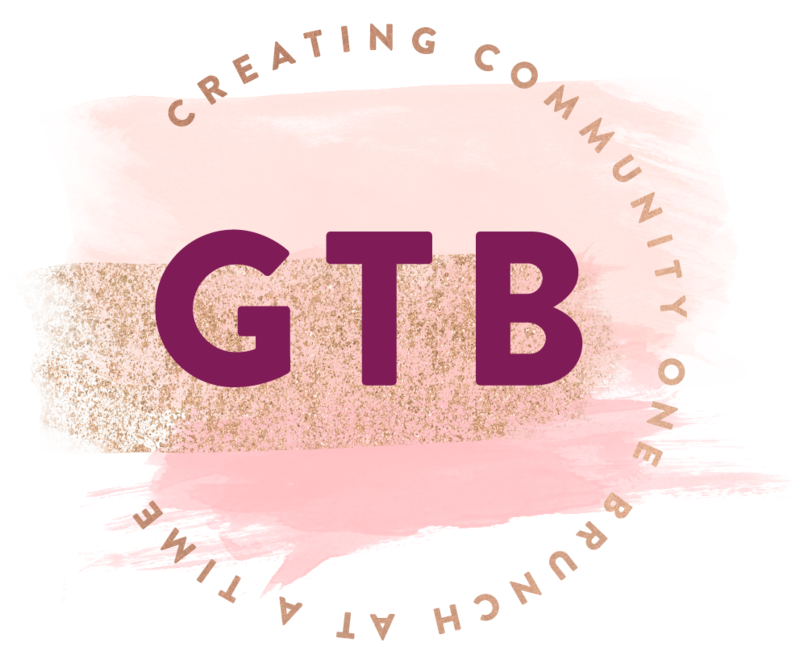 That this entire brunch thing is actually a movement to bring about freedom and opening doors for community and for women in San Diego and beyond.Tiffany A you are doing a very good thing!! So happy to have met you and laughing about brunch, pjs and how God moves”. That, my friends, is what makes this all the more real. Yes, we go around town and find the best brunch spots, but even more than that, it’s a movement that's happening. Around the table, life happens. Hope is breathed, smiles and laughs are shared, even a tear now and then as we participate in each other’s stories. Around the table, conversations spark and friendships form. Around the table, you take in the sights, smells, each other's pajamas and a sigh of relief. I actually think the pajamas faciliated an even greater level of vulnerability as you had to get over yourself (haha) and walk out in public like that. I think it allowed for some unknowing guards to be let down and enjoy the fun that this whole experience had to offer. Friends, acquaintances and STRANGERS sitting around the table and enjoying a meal together with heartfelt conversations and connections. I love how this works. I love what is happening and it’s so good. I laugh to myself because there are so many times when it feels like one big social experiment, but whatever it is, it's magic and everything wonderful! Championing and empowering women, it changes my life, it shifts something in all of us and it's impacting our communities and cities. Stay tuned for the road ahead, it’s about to get wild. Note: We are so thankful for Pete and Alex and the whole team at The Hills. We thoroughly enjoyed our morning and had one of the most stupendous service experiences. Thank you for being such wonderful hosts and everyone go visit them!